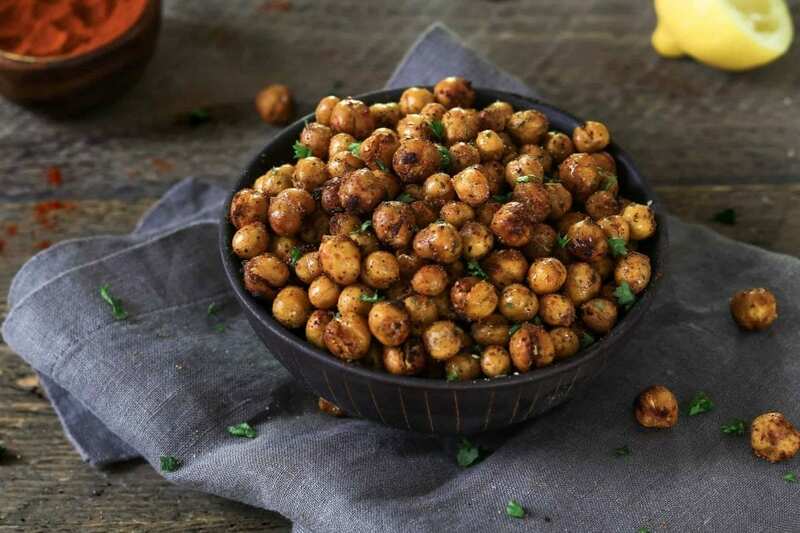 Up your snacking game with these Smoky Air Fried Chickpeas. They are quick, easy, healthy and a little bit addicting. No air fryer? No worries, I’ve included an oven method too. 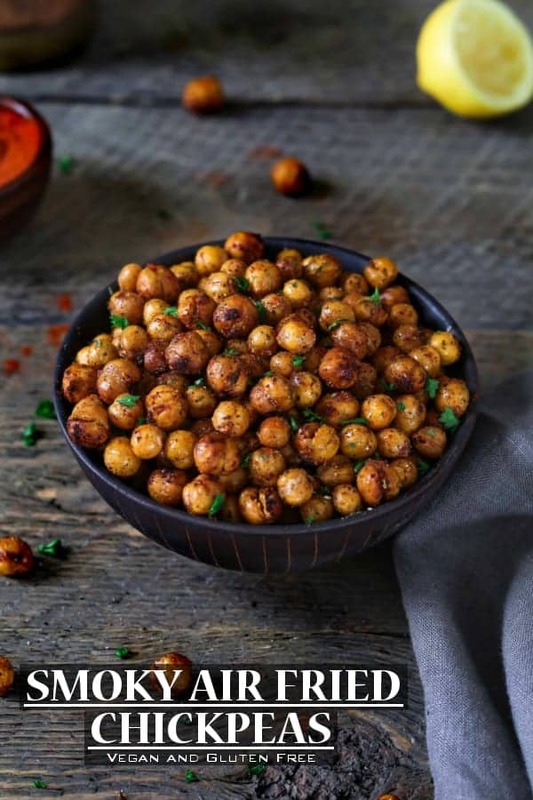 If you’re a serial snacker like me, you might want to try these healthy Air Fried Chickpeas. They are crispy, smoky, tangy, spicy and just absurdly delicious! I never thought I would succumb to the air fryer craze, but I totally caved. I liked the idea of a healthier alternative to frying, but I reeaally LOVED the idea of it cooking food FAST! I’ve been a member of Vegan Air Frying Enthusiasts on Facebook for a while and I just couldn’t believe what everyone was cooking in their air fryer. I needed to join the fun! You can make all sorts of typical fried foods in a much healthier way. BUT, you can also cook up things like Orange Tofu, Burgers, Hot Dogs, Taco Crunch Wraps, Casseroles, Sushi Rolls, Veggies, Grilled Cheese Sangys, Croutons, Taquitos and even Baked Sweets. The sky’s the limit! I’m going to try my Vegan Crab Cakes and Vegan Mozzarella Sticks next. I’ll keep you posted! After some research, I decided to purchase the Philips Air Fryer model. It had great reviews and had a bit more room than other brands. I’ve been super happy with it and it has been working flawlessly. I’m hooked! 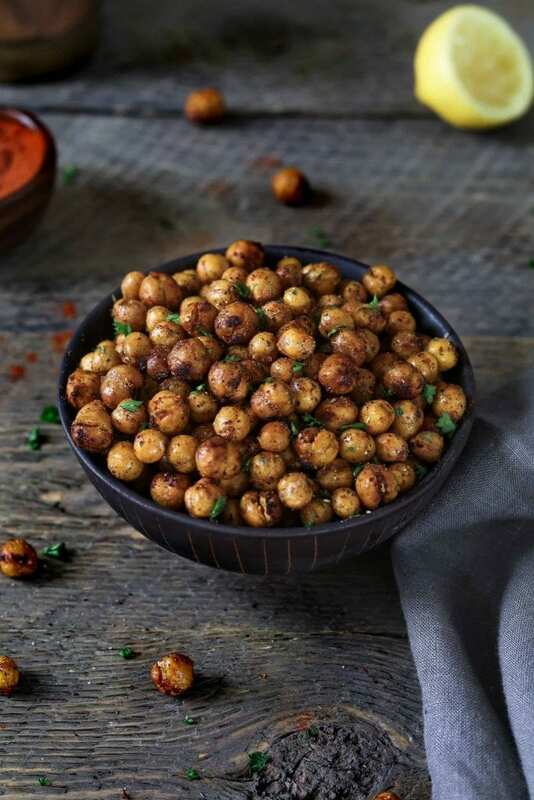 One of my first recipes in the air fryer were these smoky chickpeas. They are just as healthy and delicious baked in the oven, but so much faster in the fryer. It usually takes about 15-18 minutes for crunchy perfection. To start, rinse and drain the chickpeas well. I don’t usually remove the skins because I’m lazy, but you can peel them if preferred. Place them inside a dry towel and gently roll around. Most of the skins will loosen. Now set your Air Fryer to 390 ° F and prepare your seasoning mixture. In a medium/large bowl, add the oil, lemon juice and all seasonings. Whisk to combine well and set aside. Place the plain chickpeas in the basket and fry for 15 minutes. Shake basket once at the midway mark. The chickpeas should be dry at this point. Carefully add dried chickpeas to the bowl of seasoning mixture. Stir to combine well and place the seasoned chickpeas back in your air fryer basket and set to 390 ° F.
Air fry for 2-3 minutes until desired crispiness is reached. Shake basket once at the midway mark. * Watch carefully at this point to prevent burning. Taste for seasoning and add if needed. Enjoy right away or store in airtight container for 3-5 days. Let completely cool before storing. * If your air fryer is small, you may need to work in batches to ensure even crisping. If you don’t have an air fryer, you can still enjoy this tasty snack using your oven. The time will take a little longer, but the method is just as easy. – In a medium/large bowl, add the oil, lemon and all seasonings. Whisk to combine well. Set aside. – Place plain chickpeas on a baking sheet in a single layer. – Bake for 20-30 minutes until dry throughout. Move beans around every 10 minutes or so. – Carefully add the dried chickpeas to the prepared bowl of seasonings. Stir to combine well. – Place back on baking sheet and cook for another 15-20 minutes until desired consistency is reached. * For super crispy chickpeas, turn off oven and leave the door slightly ajar. Let them sit for 30-60 minutes more. Store in airtight container. If you make these Air Fried Chickpeas, let me know what you think by ★ star rating it and leaving a comment below. It would really make my day. You can also follow me on Instagram and share your creation with me. Just tag me @veganhuggs and hashtag #veganhuggs so I don’t miss it. 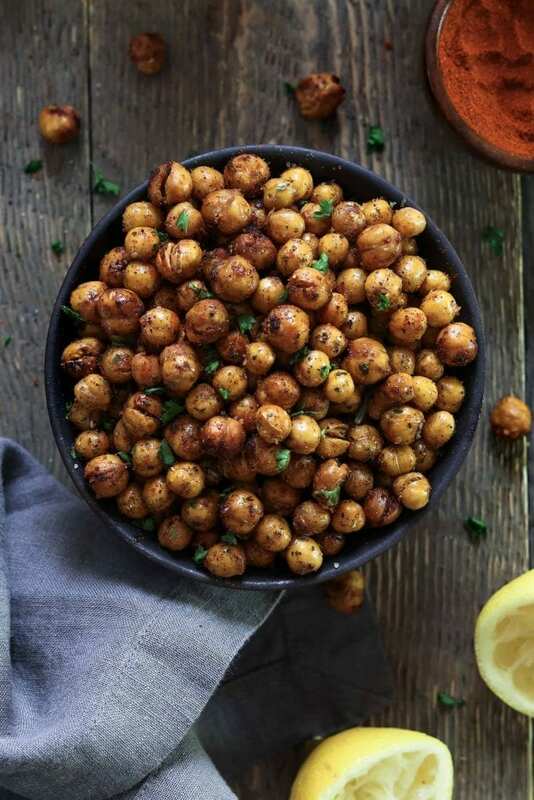 Up your snacking game with these Smoky Air Fried Chickpeas. They are quick, easy, healthy and a little bit addicting. No air fryer? No worries, I've included an oven method too. Set your Air Fryer to 390 ° F.
In a medium/large bowl, add the oil, lemon and all seasonings. Whisk to combine well. Set aside. Place the plain chickpeas in the basket and fry for 15 minutes. Shake basket once at the midway mark. Carefully add chickpeas to the bowl of seasonings. Stir to combine well. Place the seasoned chickpeas back in your air fryer basket and set to 360 ° F. Now fry for 2-3 minutes until desired crispiness is reached. Shake basket once at the midway mark. *Watch carefully at this point to prevent burning. - In a medium/large bowl, add the oil, lemon and all seasonings. Whisk to combine well. Set aside. 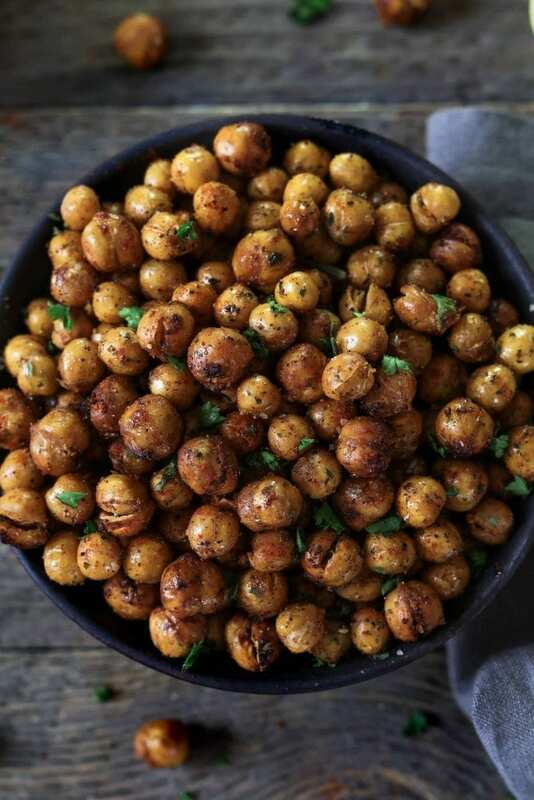 - Place drained chickpeas on a baking sheet in a single layer. - Bake for 20-30 minutes until dry throughout. Move beans around every 10 minutes or so. - Add dried chickpeas to the prepared bowl of seasonings. Stir to combine well. - Place back on baking sheet and cook for another 15-20 minutes until desired consistency is reached. What a delicious recipes you always place on your website. How do you, if I may ask, get these ideas? These sound so tasty! 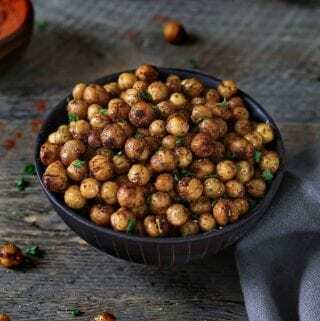 I love adding fried or roasted chickpeas to salads or even just to snack on. I look forward to seeing what you make next from your air fryer!